Every roadmap you create in Roadmunk comes with an All Data view in addition to the default View 1. The All Data view displays ALL the items in a roadmap in the Items Table, which makes it a handy, useful reference for when your roadmap has over 100 views! You open the All Data view the same way you open any other view. 1. On the Roadmap navbar, click to open the View dropdown. 2. In the dropdown, select All Data. 1. All Data is selected in the View dropdown instead of a roadmap view. 2. The Filter icon on the View navbar is grayed-out and disabled. That's as it should be, since All Data provides an unfiltered view of the roadmap's items. 3. The Milestones Table is accessible from the View navbar but the navbar doesn't provide access to a Timeline or Swimlane. To access the roadmap's visualizations, you have to select the corresponding view in the View dropdown. 4. The Export icon on the View navbar is enabled so you can export ALL the items to a CSV file. Why do you need the All Data view? There are a number of reasons why you need the All Data view. Access the entire, unfiltered data set. Unless you haven't created any visualizations for your roadmap, the All Data view is the only way you can access the roadmap's entire, unfiltered data set. For more on filtering, go to Filter items in this collection. Access milestones. 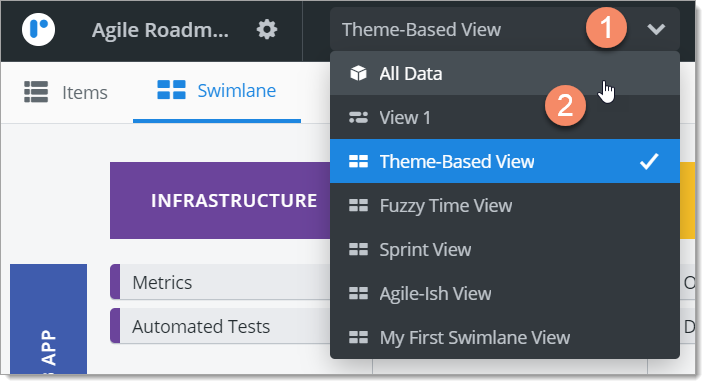 If your roadmap has only Swimlane visualizations, the All Data view is the only way you can access the roadmap's Milestones Table. And even if the roadmap does have a Timeline visualization, All Data is still the only way you can access milestones unfiltered. For more on milestones, go to Milestones in the Quick Guide and Add milestones to a roadmap in this collection. Export ALL items and ALL milestone to CSV. Although you can export a roadmap's items or milestones to a CSV file from any view, a view's filterset is applied when you do an export, so only the filtered items or milestones are exported. All Data is the only way you can export ALL the items or milestones in the roadmap. For more on exporting items and milestones, go to Exporting and publishing in the Quick Guide and Export roadmap items and milestones.